Hello 2018! 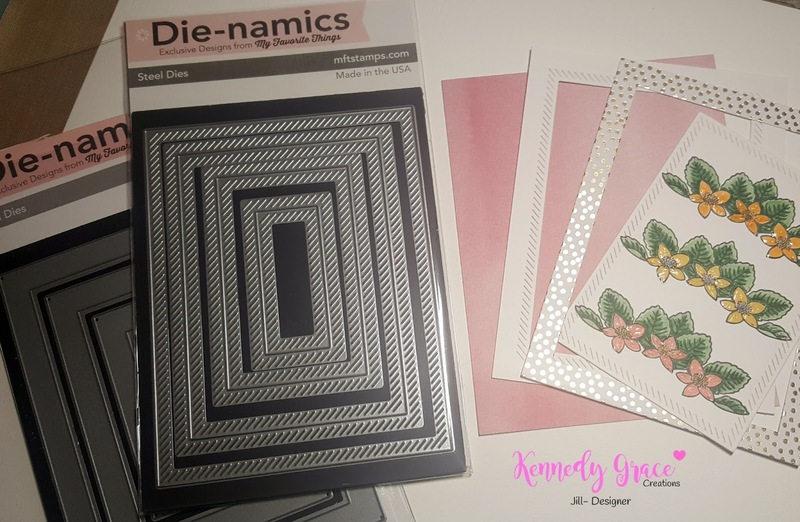 I'm back here finally on my blog from a little medical LOA and excited to be able to craft again! 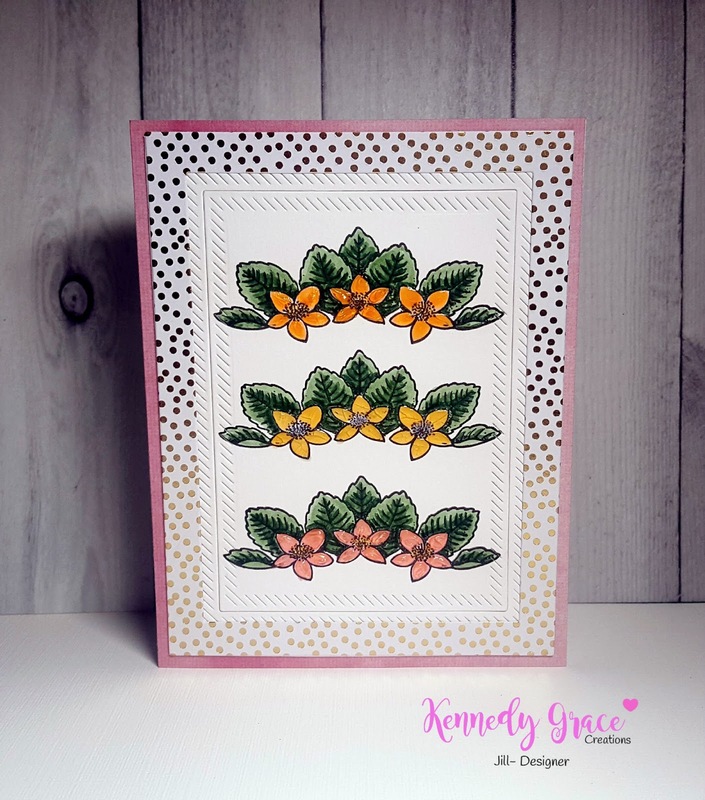 My card for Kennedy Grace Creations this month uses some lovely flower images from KGCs Grace's Little Note stamp set. As I've enjoyed a little sunshine these last few days, I felt like creating something somewhat simple with light, happy colors. 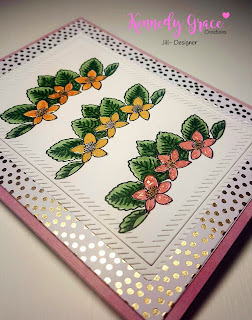 I first stamped the 3 floral images onto some smooth Bristol cardstock with my MISTI so I could get the spacing right. I then used 2 different border dies by MFTs to create the multiple-bordered look. 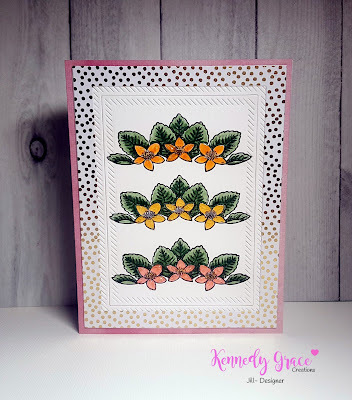 I inlaid the central flower panel into its matching border die cut, then used some fun Gold Foil cardstock by DCWV on the outside die cut frame. Since I was going to use some Nuvo Jewel Drops on my flower images, I decided to adhere all the layers first before coloring, as the drying time can take as much as 24 hours. 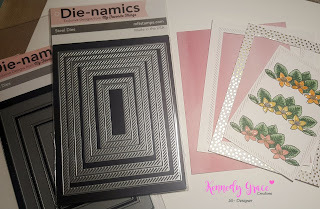 I chose a light pink watercolor Designer Series Paper from Stampin' Up! 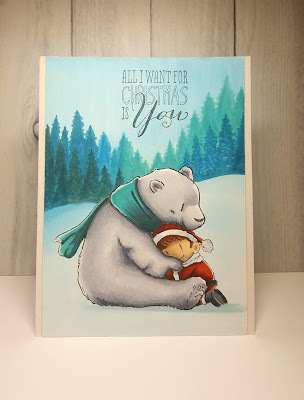 as my base layer to coordinate with one of the flower colors and make a nice frame of color around all the white going on in the card. Finally I get to the coloring, my favorite part! I decided to use some markers that I'd not used in a while, the Tombow Dual Brush Pens. I chose 2 greens for the leaves and 3 soft pastel colors in yellow, orange, and pink. After my coloring was done, I picked out coordinating colors of Nuvo Jewel Drops (Limoncello, Orange Marmalade, and Rosewater). I applied the drops somewhat generously, as I wanted dimension. Then I set my project aside to dry. I returned the next morning and adhered the panel to a standard A2 side folding card base. Project complete! I hope you enjoyed my card idea. 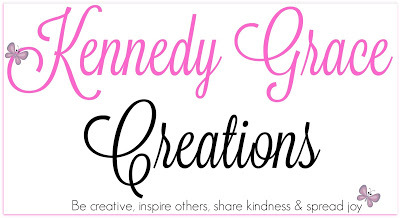 I've linked the Kennedy Grace Creations products to the store for your convenience. To see more of my cards, the most comprehensive collection of my cards can be found on Instagram as jktaylor911. 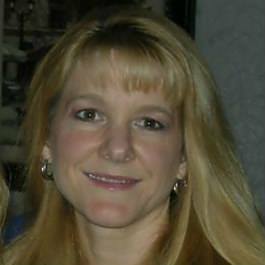 Enjoy the new year my friends!